Claressa Shields delivered a friendly, yet honest talk to Cris Cyborg following her UFC 232 loss. Cyborg defended the UFC women’s featherweight gold against women’s bantamweight title holder Amanda Nunes. “The Lioness” starched Cyborg in just 51 seconds to become the first female two-division champion in UFC history. This is Cyborg’s first professional mixed martial arts loss since 2005. That was her pro debut. 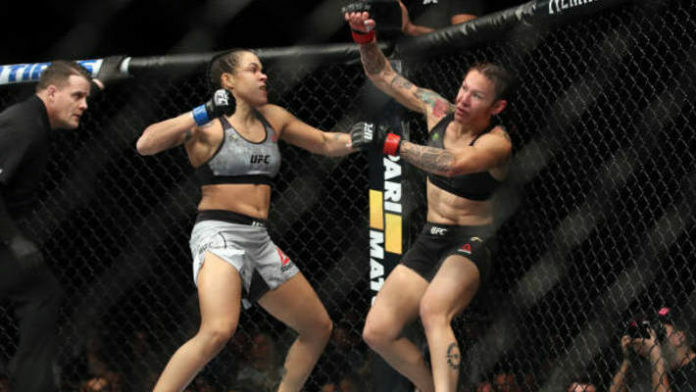 Cyborg has been known for being the most feared female striker in MMA, but Nunes blitzed her and Cyborg had no answer. UFC 232 was headlined by a light heavyweight title rematch between Jon Jones and Alexander Gustafsson. Jones reclaimed the 205-pound gold, scoring a third-round knockout over Gustafsson. MMA News provided coverage of UFC 232, so be sure to peep the results, highlights, and post-fight tidbits if you missed anything. Do you think Cris Cyborg threw her game plan out the window in favor of pride?